Hey guys, today I’ll be going over how you can use your Mighty or Crafty vaporizer with pretty much any glass that takes an 18mm male adapter. In this Crafty and Mighty Water Pipe Adapter video, I’m using the D020-D and D021 bubblers and the whip from my Extreme-Q. Don’t get me wrong, I love my Crafty and Mighty with just the stock cooling units. But when I am at home, lounging around, I still definitely prefer to hook them up to water. There are currently two people I know are working on creating water pipe adapters specifically for the Crafty and the Mighty, one is heat resistant silicone, the other will be wood. I will be very anxious to try them when they are released, and I am also hoping someone comes out with a small simple GonG adapter. 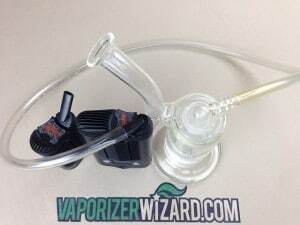 For now the best solution I have found for using your Storz and Bickel portables with a bubbler and bong is the Arizer Extreme Q Whip. Once you have your whip and vape, all you need to do is remove the metal screen from the GonG side, and then slip the silicone tubing over your Crafty or Mighty cooling unit straw. It is literally that simple, this will allow you to take much larger/longer/hotter draws without coughing, or take the same draws you normally do while being smoother and less dry. Other than hindering the portability, the only small downside to me is the whip. I don’t need the added cooling of the whip since I have the water pipe, so it is just something else to build a little bit of reclaim on. If I had an extra whip I would cut it much shorter, but this is my only one, so I will not be cutting it short for now. One benefit of adding water to your vaporizer, is that I can finish a session much quicker. With water I can take larger/longer/higher temp draws, and thus finish a session and get back to my task quicker. Depending on this situation this can be a very nice benefit. If you haven’t already checked out my instagram, I post a lot of pictures, and I am just starting to do more videos as well. That is probably the best way to keep up with the latest vaporizers I am testing/trying. You can also check out my best portables article for more information on the latest portable vaporizers to hit the market. Do you think this would fit the S&B Plenty vaporizer mouth piece to? I dunno man. It looks a little thicker than the Mighty and Crafty mouthpieces. I’m going to guess no but I don’t know for sure. Sorry for the lack of useful info lol I haven’t got my hands on a Plenty yet. It won’t, but you can get some rubber tubing at the right size and use it at the end of the whip to connect with the bong if you don’t mind it running through the whip before hitting water. It’s awkward though. I put water in my mouth to filter, then spit it out. Curious if the guys working on adapters you mentioned had any Fruitation on those products. Thanks. Check out Delta3DStudios. They have a couple different WPA’s that will work with the Mighty/Crafty. Will the tubing that you get with an SSV work? And on a separate subject, I’ve had a lot of problems with my SSV recently. I’ve found that it only works well when I fill the ground glass herb compartment up near the top with herb. I’m running it through a whip and a huge perc Black Skulls bong so maybe it has too far to travel? I actually don’t have the SSV yet but hopefully soon. Let me ask around and I’ll get back to you. They have changed the piping for the whip that I got from vapeworld, I’ve talked to them and let them know but they said there hasn’t been any changes but there has been because i’ve bought from them before, the piping was thicker last time now its more matte finish and easily bendable. So do you think its better overall? I’m new to this concept of Crafty + water pipe. What are the improvements according to you? Thanks Trung! Happy New Years to you as well! 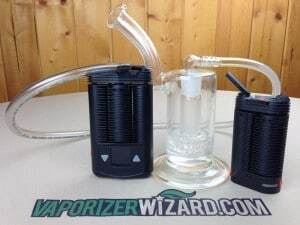 The water pipe adapter or WPA will allow you to connect your crafty/mighty to water piece/bubblers/bongs and you can then vape much higher temperatures without the effects of harsh vapor on your throat. You can take much much bigger pulls. The water removes some of the taste from the herb but it all depends on how much diffusion the glass has. I would recommend a glass piece with a small out of diffusion for vaporizing because you want to taste the herbs as much as possible. Whereas with combustion or just lighting up and taking a bong hit, you would want a LOT of diffusion to filter out the combustion taste. Let me know if you have any more questions. I pick up all my glass from Sunshine Store on DHGate. I’ve always just use sunshinestore on DHgate and they usually have everything there, just takes a minute to find it. tubes. Dear wizard, what do you mean when you talk about a glasspiece with small diffusion? Are those you recommened the best or do you have other suggestions (live in Europe)? And is there any difference in the working of a bubbler vs a bong? Last question; do you know the tubing size? If i buy another bubbler i need to know for sure if it will fit. Small diffusion means that less of the taste is being removed via filtration. With less diffusion you get more taste which is what you want with a vaporizer. Too much diffusion will leave very little taste. Generally heavy diffusion pieces are better for combustion and concentrates. Most pieces will fit 14mm glass so if you get an 18mm piece you might just have to pick up the 18-14mm connector for it to work. I use my Grasshopper/Crafty/Mighty all work perfect with the D020-D from Sunshine Store on dhgate and that is a 18mm so I use an adapter as well. I love this video, Wiz! Hey i just bought the DO21 and i have the mighty. I got the tube also. I have connected the tube to the mighty and into the glass piece. But its extremely had to get a pull/draw. The water ive put into the bong piece hardly bubbles. Any help would be great. Hey David, would you try drawing on the mighty itself, and then the mighty with the tube, and then lastly the mighty with the tube and the glass, and try to notice if the draw resistance changes? I am curious if one specific part is causing the extra resistance because while I do get a bit more resistance than using the Mighty alone, its not by much. I seem to be very sensitive to inhaling and cough very easily. I have been thinking that the sensitivity was related to temperature and that I would get the Volcano because it would cool down the vape in the bag and keep me from coughing, until I saw this. You wrote above about using the Volcano with the D020-D and that made me wonder what the bubbler was adding if the temp was already low in the bag? Then I was struck by your coughing with the Mighty/bubbler combo. The Mighty and the Volcano are very different, but I thought it couldn’t be the temp after going thru the bubbler and wondered if it was the vape itself? I’d like to maintain a mild, level buzz over 3-4 hours taking hits as needed, but the video has me wondering if vaping is in the cards for me at all. With the accurate combustion temp control and cooling in the bag, am I likely to find a sweet spot with the Volcano so I can inhale without coughing? Is any other product more likely to accomplish this than the Volcano? Will the Volcano work well with small amounts of bud? And why is vape smoky? Is it water vapor? Thanks for your thoughts. Hey Darby, the first thing glass/water do is cool the vapor like you mentioned, the second and arguably most noticeable thing is that it moisturizes the vapor. Both the high temps, and the dry vapor increase coughing for most people myself included. I can vape larger bowls and higher temps without coughing when I use water, but I can still definitely push it with bowl size or temp and end up coughing even with water. The Volcano works very well for coughing minimally, especially in water. It also works well with small loads, so you can definitely pack it lightly, and run a low or medium temperature and you should have no coughing problems, especially with water. The Vapor does seem smokey, but there is no actual smoke in it. It is mostly the boiled/evaporated oils from within the herbs with a little bit of water vapor as well. Thanks for the inspiration man !